Taking a digital photograph has its moments. You do have to understand how to get the best photograph whenever you have the camera ready in your hand. Well, you do need to practice and check out a couple of times before you finally master the art of clicking photos with digital photography. Handling and Holding of the camera – you do need to learn to handle and hold the digital camera in the most suitable manner. When you are handling the camera, your spare fingers should not move or shake. The camera straps could be safely entangled within your fingers so that they do not hinder with your photo shooting process. The optical view finder should be in level to your eye, thus ensuring you get to capture the best view of your subject and a stable photograph. Focusing – Do remember that most digital cameras do take extra time to focus. To begin with you do have to half click the shutter button, till a focus bracket is visible and then proceed with clicking the photograph with a full click on the shutter button. In most normal conditions a slight shake of your hands will be taken care of by the digital camera. In case of low light wherein you need to use a long zoom lens along with a slow shutter speed, you need to make use of a tripod which works best in reducing the hand shakiness and blurring of the image. Preview – The definite advantage you enjoy over a film camera is availing the preview feature which is incorporated in the digital cameras. With almost instantaneous view of image on the camera screen, you can review it and re-shoot it if you are not happy with the final image. 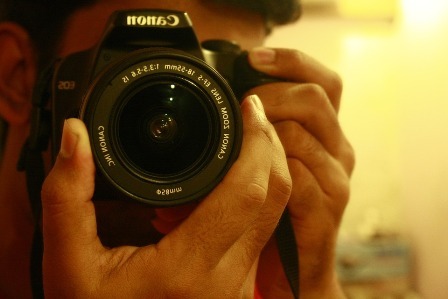 Thus, each time you click, you can always review and re do the shoot till you get the best shot for yourself. Storing – You have clicked near perfect pictures but make sure you transfer them on to a CD or a hard disk before you clear the memory card. In case of loss or spoilage of the memory card, you will find extremely hard to retrieve these images. Also you by transferring these images to another storage space, you can reuse the card a couple of times over. It pays to keep an alternate memory card handy. Batteries – Before you venture out on your photo session, it would be advisable to recharge your batteries well. A spare set of charged batteries should be always kept handy, for you never now when you could need them. In case you have access to electricity, you could always keep a battery charger with you which will allow you to charge them as frequently as you wish. Make sure you make just use of your digital cameras when on a photo shoot for you do need to complete the photo shoot rather than exhaust your batteries half way leaving you in a lurch amidst the photo shoot. It would be great if you prepare for your photo session well in advance, acquire basic knowledge of digital photography and keep trying till you finally master the art of digital photography. Tips for Digital Photography : Digital photography is intriguing and interesting. With many aspects to digital photography such portrait photography, wedding photography, you need to keep yourself on each of them to gain due expertise.